On the morning of Dec 24, a 10000-ton vessel built in Hainan began its first trial voyage from Jingang Port, Lingao County, which indicated that Hainan is capable of building a 10000-ton vessel for the first time, reports hinews.cn. The vessel, called "Hongxin 6", is 140 meters long and 20 meters wide. The vessel’s load capacity can reach 13,800 tons. The vessel was built by the Hainan Weilong Vessel Engineering Co. Ltd. In 2008, and they have invested RMB1.8 billion to set up a shipyard base in Jingang port, planning to produce 12 types of vessels annually. On June of 2009, Hainan Shipping Logistics LLC signed an order for a bulk carrier of 13,800 tons with the Weilong Company. 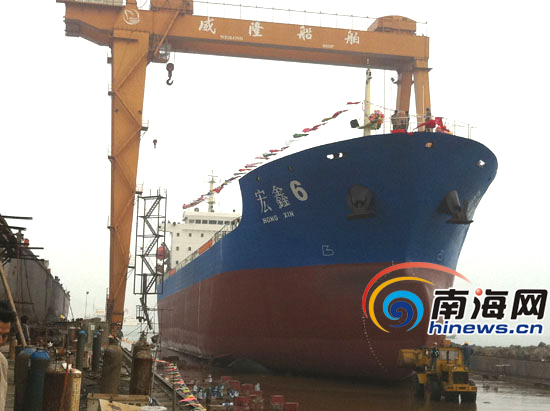 This is the first 10000-ton vessel that was built in Hainan.